Zoological methods of studying behavior patterns in animals have led to insights on people with serious mental disorders. 's Zoology Department recorded patients with obsessive-compulsive disorder and "schizo-OCD", which combines symptoms of schizophrenia and OCD, as they performed basic tasks. By analyzing the patients' movements, they were able to identify similarities and differences between two frequently confused disorders. The research represents a step toward resolving a longstanding question about the nature of schizo-OCD: Is it a combination of OCD and schizophrenia, or a variation of just one of the disorders? The researchers concluded that schizo-OCD is a combination of the two disorders. They noted that the behavioral differences identified in the study could be used to help diagnose patients with OCD and other obsessive-compulsive disorders, including schizo-OCD. "I realized my methodology for studying rat models could be directly applied to work with humans with mental disorders," Eilam said. "Behavior is the ultimate output of the nervous system, and my team and I are experts in the fine-grained analysis of behavior, be it of humans or of other animals." The main features of OCD are, of course, obsessions and compulsions. Obsessions are recurring and persistent thoughts, impulses, or images that are experienced as intrusive and unwanted and cause marked distress or anxiety. In contrast, compulsions are repetitive motor behaviors, such as counting, that occur in response to obsessions and are performed according to strictly applied rules. Schizophrenia is marked by delusions, hallucinations, disorganized speech, abnormal motor behavior, and diminished emotional expression, among other symptoms. Eilam and graduate student Anat Gershoni of the Zoology Department and Prof. Haggai Hermesh of the Sackler Faculty of Medicine set out with Dr. Naomi Fineberg of the Queen Elizabeth II Hospital in England to resolve the controversy. To this end, they recorded and compared videos of diagnosed OCD and schizo-OCD patients performing 10 different mundane tasks, like leaving home, making tea, or cleaning a table. The patients met the criteria of the widely used Diagnostic and Statistical Manual of Mental Disorders. 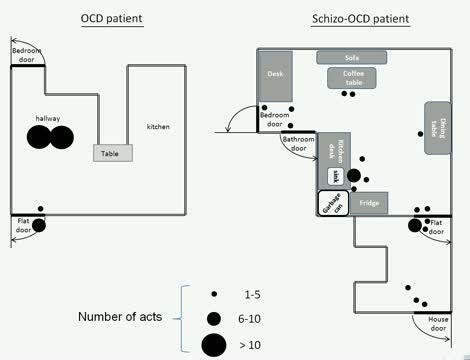 The researchers found that both OCD and schizo-OCD patients exhibited OCD-like behavior in performing the tasks, excessively repeating and adding actions. But schizo-OCD patients additionally acted like schizophrenics. For a typical OCD patient in the study, the task of leaving home involved standing in one place and repeatedly checking the contents of his pockets before finally taking his keys and cell phone and going to the door. In contrast, a typical schizo-OCD patient traveled around the apartment – switching the lights in the bathroom on and off, then taking his keys and phone to the door, going to scan the bedroom, then taking his keys and phone to the door, going to empty the ashtray, then taking his keys and phone to the door and so on. A typical healthy person would simply pick up his keys and phone and walk out. Overall, the researchers found that the level of obsessive-compulsive behavior was the same in OCD and schizo-OCD patients. This suggests that both types of patients had the difficulty shifting attention from one task to another that helps define OCD. The schizo-OCD patients, though, did more divergent activity over a larger area than did OCD patients. This suggests that the schizo-OCD patients were continuously shifting attention, which happens in schizophrenia but not OCD. "While the obsessive compulsive is obsessed with one idea; the schizophrenic's mind is drifting," said Eilam. "We found that this is reflected in their paths of locomotion. So instead of tracking the thoughts of the patients, we can simply trace their paths of locomotion." Eilam plans to conduct research comparing repetitive behavior in OCD and autism patients.